Capcom’s strong support for Monster Hunter 4 Ultimate on the 3DS continues with both new and free DLC arriving on a monthly basis. So far this content has included new quests, items, and even well-known video game character collaborations. With new DLC content anticipated to arrive over the coming days, this week’s GameStop advert may have already let slip what is in store for users next month, featuring an image of Palico equipment based on Mega Man, Blanka from Capcom’s Street Fighter series, and armour including Samus’ Varia Suit. All of these items were previously announced by Capcom, so an arrival in the near future is expected. Past themed DLC has featured Super Mario Bros. and Sonic the Hedgehog. If you’re a monster hunter, let us know in the comments if you think the above-pictured content will arrive in May. Awesome! Love mega man palico suit! I haven't been playing Monster Hunter 4 because I wanted to get MH3 done with, but will I be able to get these pieces of DLC whenever I want? It's not for a limited time only, is it? @DrVollKornBrot Uh you sure about that? as im sure thay sed that its all the Veria suite and when thay get weak it terns into Zero Suite. Im realy looking forward to this DLC im totaly useing the Card bg from Metroid. @edhe only the Welcom pack was for a limited time as far as I know. I'm bout to pick this game up real soon, new to the series, but do the free DLC packs ever expire? I kinda wonder if the Metroid DLC missions come out next month. I'm expecting the DMC pack next, actually (though it's a serious shame it only offers Palico equipment - Having Dante's coat for hunters would be pretty awesome). @edhe @NARDDAWG So far, no limitations has been made, so the DLC will most likely remain free indefintely. @Volmun Nope. The Varia Suit is male only, while the Zero Suit is female-exclusive. However, both armors have identical skills and stats for Blademaster and Gunner, respectively. I'm looking forward to the new dlc especially considering that I'm stuck advancing my quest log because NOBODY wants to fight Gogmazios. @shigulicious Ugh i feel your pain, i was in the same spot for a while.. Persistance is the way to get that stuff done, create/look for hours until you FINALLY get a group. A female dog to kill too, Gogma. I hope the Animal Crossing one also releases, though I'm fine with getting the Mega Man palico armor. I want G-Rank quests! Including a Silver Rathalos G-Rank. Still more canon than Other M.
Awesome. 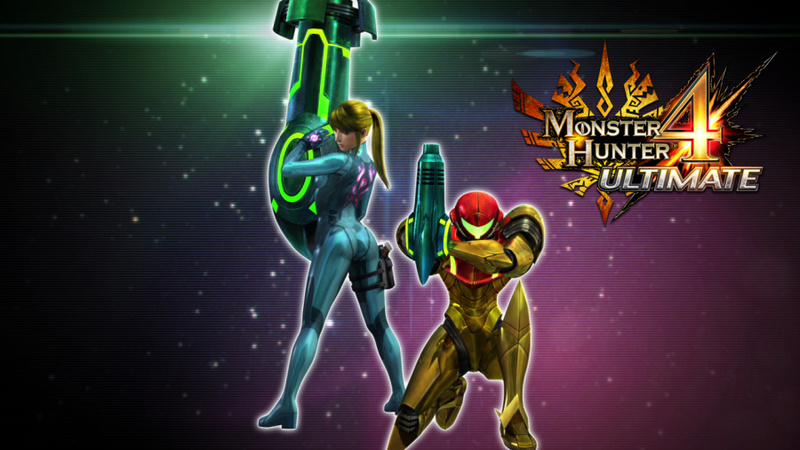 I'm thinking just doing a set up for gunner, to have the Samus lightbow gun at the same time. Maybe I'll do both if it comes to it. Oh for anyone looking there are different skills for the Male and Female versions on the Monster Hunter Wiki. The armours are towards the bottom, weapon is also there. Alright, alright, I'll think about finally picking this up. The only N3DS I have is from Japan; is it tolerable on the regular 3DS? Cool. I'm slowly working through the past DLC. I only have the fan club stuff right now though. I love this game waaaaaay more then I thought I would. I would say that if you played the demo and had even 1 ounce of fun.....you should buy this game now. I can say that for certain that at least playing as a male character that you can craft and wear both the Varia and Zero Suits. I already have the Varia Suit and am in the process of making the Zero Suit. One of my online friends I play with regularly has the full Zero Suit and he is a male character. It's funny, the the male headpiece for the Zero Suit almost looks like a Ken doll head. Additionally, both sets of armor each have blademaster/gunner versions, and don't come with waist component, so you have to fill in a waist part that's compatible skill wise. So I'm just saying, unless there's been some major change from the Japanese dlc in the West, both sexes can craft both Metroid themed sets. Yes, males are able to wear the Zero Suit armor. It even comes with a male headpiece. Bwahaha! Even comes with special Congalala flatulence attack so you can stink up friends and enemies alike! Nope, assuming it goes both ways, I'm a male character but I already have the Varia Suit and most of the Zero Suit. Not sure this can really be considered a leak considering that the same free DLC that's released in the West for free gets released in Japan a few months earlier because they got the game earlier. This is so cool. I might give this game another chance. I can help you with Gogmazios. You should come join us on the MH Community forum though- there's always people willing to hunt with you if you give some notice, heck even spur of the moment. It's so much funner hunting with members here than randoms. lets not start a sjw fest in here. Of course this means varia is female as well. @FubumblR See thats what id asumed (even thogh i was sure thay sed something about the Power sute becoming the Zero Sute when your weak ohwell lol) Thanks for clearing it up!. Yeah, always good to trust your instincts. Make no sense why the devs would limit these sets when there wasn't any such limit on the Link armor. Also, the May dlc is now live!